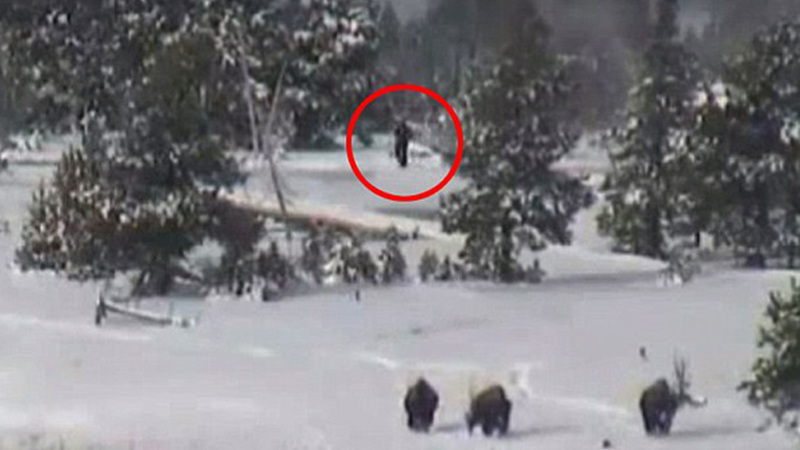 Bigfoot aficionados are claiming that a Yellowstone webcam has captured up to four of the unconfirmed creatures after a seemingly innocuous video of buffalo roaming through the park appears to have something more exciting going on in the background. YouTube user Mary Greeley, who routinely records video off of numerous websites, posted the footage online to show buffalo arriving at the Old Faithful geyser. Weeks later, some viewers raised questions about the peculiar looking characters toward the end of the video. Now every amateur sleuth and armchair cryptozoologist wants to weigh in on the possible sighting of the infamous cryptid. Greeley wrote that she copied and uploaded the footage, completely unaware of the possible sighting. 1. The character may be 6' to 8' tall when compared to the buffalo. 2. It's body appears disproportionate compared to humans. 3. The characters might actually been seen earlier in the video as well. "Are we witnessing some ancient scene that has been going on for thousands and thousands of years? You decide," said ThinkerThunker. On the assertions that the subjects could have merely been tourists roaming the park, ThinkerThunder and other Bigfoot fans say that's just nonsense.